All units are completely furnished and come with fully equipped kitchens, cable television and free internet access. Some have a private patio or balcony with a delightful ocean view. Swim in the year-round heated pool, soak in the whirlpool spa or relax in one of several spacious courtyards. Take in the mountain views, turn around and catch the Pacific blue. Savor the spectacular sunsets. 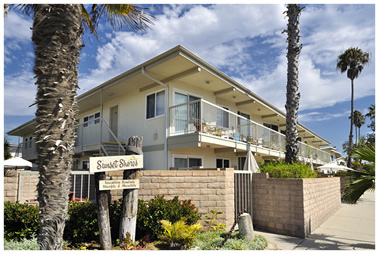 Park the car in the gated lot – the best way to see and enjoy Carpinteria is by bike or on foot. Downtown shops, restaurants, art galleries, and a weekly farmers market are a short stroll away.